Giant Rice Krispies Treats sculpture celebrates "ELF The Musical"
MIDTOWN, Manhattan (WABC) -- New York City got a special "treat" today! 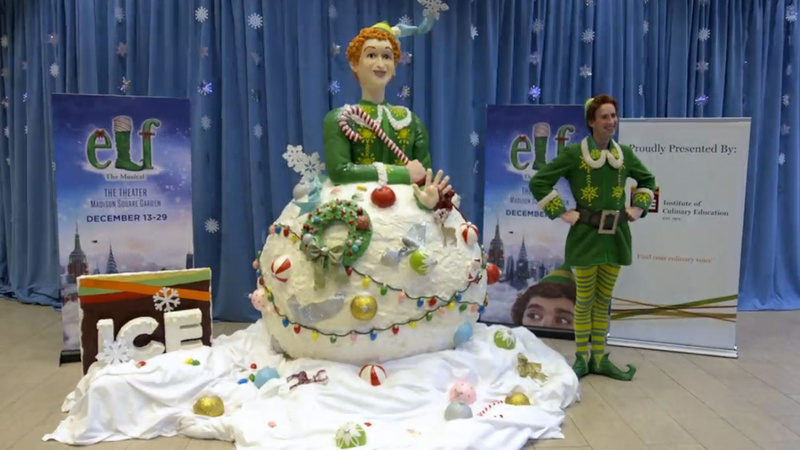 To celebrate the return this holiday season of "ELF The Musical" to the Theater at Madison Square Garden, a larger than life ten-foot sculpture of "Buddy the Elf" was unveiled today made completely out of Rice Krispies Treats! The ELF, himself, was there for the big reveal. Joining the ELF were the chefs from the Institute of Culinary Education who handcrafted the giant food sculpture in honor of his much anticipated return to New York City. The chefs designed and built the sculpture in 500 hours with nearly 300 pounds of Rice Krispies Treats, 15 pounds of edible glitter, 76 pounds of icing, 70 pounds of chocolate, and 50 pounds of fondant. After the unveiling and taste testing, the Big Apple's biggest treats sculpture was donated to the New York City Department of Homeless Services.